Olets are known as branch connection fittings used to provide an outlet from a larger pipe to a smaller one. Threadolet utilizes the basic Weldolet however the branch affixes by way of a thread just inside the top of the olet. The bore matches the outlet bore, and the existence of this threading facilitates installation, as no welding is necessary. The Thredolet is considered a threaded fitting, andmanufactured in 3000# and 6000# classes. It is designed in accordance with international quality standards. JF Engineering deliver Weldolet Olets that are extensively used in various industry applications available in several size, grades, dimensions and grades in all materials such as stainless steel, duplex steel, alloy steel and carbon steel. The offered product are appreciated in the market because of the best performance and good quality of the products. Leveraging on our widely spread distribution network, we procure and deal in a high performing range of Threadolets and Stainless Steel Threadolet. Sourced fro authentic vendors, these products find wide applications in pulp & paper mills and fabrication & production of stainless steel products. These can be availed by the esteemed patrons in a wide spectrum of grades, sizes and classes. Our offered products are widely appreciated in the market for their sturdiness and dimensional accuracy. Root Gap - X - "Space" for welding the O'let is raised off the run pipe to establish proper weld gap by placing spacers, e.g. welding rods, under the fitting. 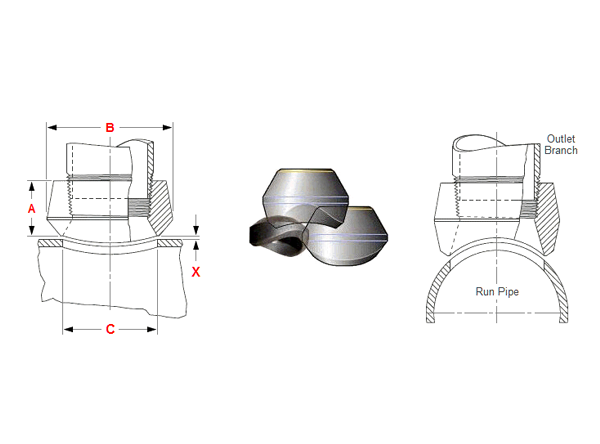 This provides a uniform welding gap between the curvature of the run and base of fitting. Threaded Ends are in accordance with ASME B1.20.1. Design per MSS SP-97. Thredolet® is a registered name. Another often used name is Threaded Outlet. Products are packaged to ensure that there is no damage during transit. In case of exports, standard export packaging is done in wooden cases. All olets are marked with Grade, Lot No, Size, Degree and our trade mark. On special requests we can also, make custom marking on our products. 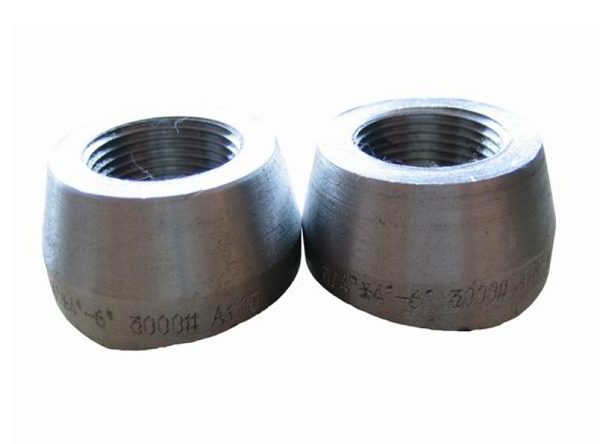 At JF Engineering Products LLP, all fittings and olets are subject to strict inspection at each stage of the production process, from starting material purchasing to product dispatch. They are visually examined for conformity to ASTM, ASME, MSS, DIN, EN, and JIS codes and standards. Upon request, official certified Inspection Agencies can be called in to witness the material reports, dimensions and quality conformity of products. Orders will be sent out within 2-3 business days, and may take up to 5-10 business days in transit. If Olets is out of stock, orders may take up to 2-4 weeks to ship. JF Engineering Products LLP will notify buyer if this situation occurs..